W00t! 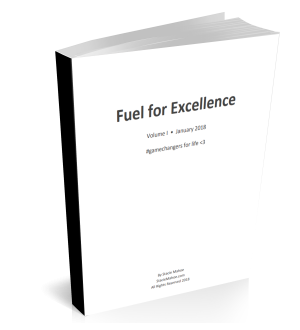 Super excited to announce the very first volume of my new e-book series, Fuel for Excellence is ready to go. This e-book contains a compilation of all the best, most inspiring, most thought provoking, most encouraging goodies I found, wrote, shared, consumed, digested, or stumbled across during the month of January 2018. It’s all put together in a very simple, easy to read, easy to print, easy to use and pass along format for you. You’ll get 58 pages of fuel for your fire as you chase down your biggest goals and wildest dreams and/or help your child(ren)/team do so. Over the weekend, I shared this e-book with a couple people and their feedback was immediately positive! That is what you get in this e-book.